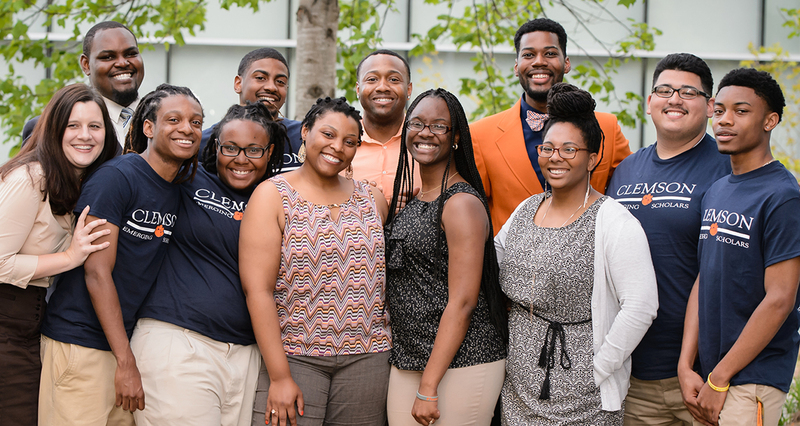 The Emerging Scholars Program is a Clemson University outreach program that specifically targets students from public high schools in three counties in the low country region of South Carolina. Designed to increase the number of students who attend and graduate from college, this three-year program begins in the summer after the students complete ninth grade and works with them until they graduate from high school and enter college. During their first summer at Clemson, the students spend seven days here on campus. In addition to focusing on reading, writing and mathematics, the residential experience includes academic evaluations, physical challenge activities to enhance self-confidence, collaborative learning exercises and detailed orientation about the college experience. Contact with the students is maintained all year through correspondence, workshops, college trips and a series of school visits. The following summer, these students will return to campus, this time for two weeks, and we build on the learning from the past year. In their third summer before their senior year, they come back to Clemson for three weeks. This time is devoted to a realistic simulation of the first three weeks of college for a new freshman. The students are “enrolled” in 5 mini-courses – English, math, a social science, a laboratory science, and art which are taught by Clemson faculty. In addition to the daily classes, the students attend nightly activities, and learn about college life at Clemson. Emerging Scholars is an educational, fun, work-intensive experience that will prove both very rewarding and very demanding. You will greatly affect the lives of the participating students and will be held to standards that reflect this responsibility. It is our hope that through the Program Advisor position, students will consciously gain leadership and mentoring skills that will help them develop as leaders and expand their views of what it means to give back and help others find their way to college. Daily responsibilities are broken up between two shifts: a morning shift and an afternoon. Even though every day will be a little different, a typical day will begin with the morning shift gathering all students for breakfast then escorting them to classes until lunch. All Program Advisors will meet for lunch with the students. The afternoon PAs will then take the students to their afternoon classes. Everyone will then meet again for dinner and evening activities will begin shortly after, usually around 7 p.m. There will be a duty system so there will be nights when you are required to be on campus and nights when you can have free time. Weekend activities vary but it is expected that staff be available to help with sessions and trips. Whether you are part of the morning shift or the evening shift will depend on your class schedule and your preferences. On nights when students are present, it is expected you sleep in the residence halls. We do allow each staff member to take one summer course per session (This is not paid for by Emerging Scholars). However, this must be disclosed during your interview and will be taken into consideration when hiring decisions are made. Deadlines and Application Dates Coming Soon! All interested, qualified students should complete an application. Each interested students should email an unofficial transcript and an updated resume to jsingle@clemson.edu by March 11th 2019. Information on references should be entered into the application. All applicants who pass an initial application review will be contacted for an interview. Video interviews will be conducted with applicants who are not located in Clemson, SC. Second interviews will only be conducted if follow-up information is needed. Any questions should be sent to Jason Combs at jsingle@clemson.edu. Thanks for your interest in the position!